Of the early history of this portion of the Asiatic continent little is known. The poverty and natural strength of the country, combined with the ferocious habits of the natives, seem to have equally repelled the friendly visits of inquisitive strangers and the hostile incursions of invading armies. One of the most striking facts in the history of Baluchistan is that, while many of the great conquerors of India have passed across her borders, they have left few permanent marks of their presence. Macedonian, Arab, Ghaznivid, Mongol, Mughal, Durrani, all traversed the country, and occupied it to guard their lines of communication, but have bequeathed neither buildings nor other monument of their presence. The earliest-known mention of part of Baluchistan is in the Avesta, the Vara Pishin-anha of which is undoubtedly identifiable with the valley of Pishln. In the Shahnatna there is an account of the conquest of Makran by Kai Khusru (Cyrus), and the Achaemenian empire which reached its farthest limits under Darius Hystaspes included the whole of the country. Among Greek authors Herodotus gives little information about Baluchistan. He merely mentions Paktyake, which has been identified with the country of the Pakhtuns or Afghans. Strabo provides the best account, and from his writings can be identified the localities into which Baluchistan was distributed in ancient geography. On the north-east, and probably including all the upper highlands, was Arachosia; directly west of it was Drangiana; to the south lay Gedrosia; while in the Ichthyophagoi, Oraitai, and Arabies or Arabii are to be identified the fishermen of the Makran coast, the inhabitants of Las Bela, and the people of the Hab river valley respectively. Alexander's retreat from India led him through Las Bela and Makran, while a second division of his army under Crateros traversed the Mula Pass, and a third coasted along the shore under Nearchus. Alexander's march and the sufferings of his troops are graphically described by Arrian, who with his usual brevity and severe veracity, narrates the march of Alexander through this region, which he calls the country of the Oreitae and Gadrosii. He gives a very accurate account of this forlorn tract and its general aridity. After Alexander's death, Baluchistan fell to Seleucus Nicator, and later on passed from his descendants to the Graeco-Bactrian kings who ruled also in Afghanistan and in the Punjab. Between 140 and 130 BC, they were overthrown by a Central Asian horde, the Sakas, who passed along to the valley of the Helmand. About this time Buddhism, of which many traces are still to be found, flourished in Baluchistan. The empire of the Sassanians which followed expanded slowly towards the east, and Baluchistan was not conquered till the time of Nausherwan (529-577 AD). Henceforth the suzerainty over the petty rulers of Baluchistan alternated between east and west. In the fourteenth year of the Hijra (635-6) Rai Chach marched from Sind and conquered Makran. The Rai dynasty at the same time appear to have extended their dominions to the north towards Kandahar. The Arabs reached Makran as early as the year 643. The parts of Baluchistan which subsequently became best known to them were Turin (the Jhalawan country), with its capital at Khuzdar, and Nudha or Budha (Kachhi). Their power lasted till towards the end of the tenth century; for when Ibn Haukal visited India for the second time about 976, he found an Arab governor residing in Kaikanan (probably the modern Na1) and governing Khuzdar. 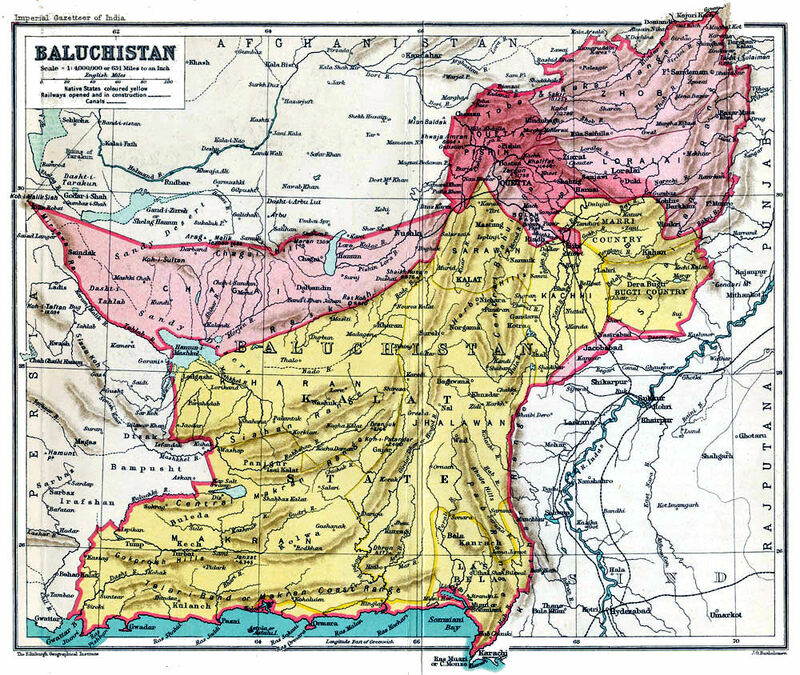 Shortly afterwards Baluchistan fell into the hands of Naslrud-din Sabuktagin ; and his son, Mahmfld of Ghazni, was able to effect his conquests in Sind owing to his possession of Khuzdar. From the Ghaznivids it passed into the hands of the Ghorids and, a little later, was included in the dominion of Sultan Muhammad Khan of Khwarizm (Khiva) in 1219. About 1223 a Mongol expedition under Chagatai, Chingiz Khan's son, penetrated as far as Makran. A few years later Southern Baluchistan came under the rule of Sultan Altamsh of Delhi, but it appears soon to have reverted to the Mongols. The raids organized by Chingiz Khan burned deep into the memory of Baluchistan. From Makran to the Gomal, the Mongol (known to the people as the Mughal) and in the 19th Century his atrocities were still a byword in every household. Henceforth the history of Baluchistan centered around Kandahar, and it was from this direction that in 1398 Plr Muhammad, the grandson of Timur, was engaged in reducing the Afghans and rise of the Sulaiman mountains. Local tradition asserts that Timur himself passed through the Marri country during one of his Indian expeditions. The succeeding century is one of great historical interest. The Baloch extended their power to Kalat, Kachhi, and the Punjab, and the wars took place between Mlr Chakar the Rind and Gwahram Lashari which are so celebrated in Baloch verse. In these wars a prominent part was played by Mir Zunnun Beg, Arghun, who was governor of north-eastern Baluchistan under Sultan Husain Mirza of Herat about 1470. At the same time the Brahuis had been gradually gaining strength, and their little principality at this time extended through the Jhalawan country to Wad. The Arghuns shortly afterwards gave way before Babar. From 1556 to 1595 the country was under the Safavid dynasty. Then it fell into the hands of the Mughals of Delhi until 1638, when it was again transferred to Persia. There is an interesting account of Baluchistan in the Ain-i- Baluchis Akbari. In 1590 the upper highlands were included in the sarkar of Kandahar, while Kachhi was part of the Bhakkar sarkdr of the Multan Subah. Makran alone remained independent under the Maliks, Buledais, and Gichkis, until Nasir Khan I of Kalat brought it within his power during the eighteenth century. From the middle of the seventeenth century Baluchistan Nadir remained under the Safavids till the rise of the Ghilzai power in 1708. 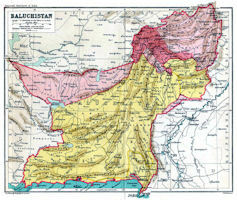 The latter in its turn gave way before Nadir Shah, who, during the first part of the eighteenth century, made several expeditions to or through Baluchistan. Ahmad Shah, Durrani, followed; and thenceforth the north-eastern part of the country, including almost all the areas now under direct administration, remained under the more or less nominal suzerainty of the Sadozais and Barakzais till 1879, when Pishln, Duki, and Sibi passed into British hands by the Treaty of Gandamak. Meanwhile the whole of Western Baluchistan had been consolidated into an organized state under the Ahmadzai Khans of Kalat. All tradition asserts that the former rulers of Kalat were Hindus, Sewa by name. As Muhammadan dynasties held Baluchistan from about the seventh century, to an earlier period dates the Sewa's; and it is not improbable that they were connected with the Rai dynasty of Sind, whose genealogical table includes two rulers named Sihras. The Mlrwaris, from whom the Ahmadzais are descended, claim Arab origin. In their earlier legends they are found living at Surab near Kalat, and extending their power thence in wars with the Jats or Jadgals. They then fell under the power of the Mughals; but one of their chiefs, Mlr Hasan, regained the capital from the Mughal governor, and he and his successors held Kalat for twelve generations till the rise of Mlr Ahmad in 1666-7. It is from Mlr Ahmad that the eponym Ahmadzai is derived. In the mid-17th Century the last raja of the Hindu dynasty found himself compelled to call for the assistance of the mountain shepherds, with their leader, Kambar, in order to check the encroachments of a horde of depredators, headed by an Afghan chief, who infested the country and even threatened to attack the seat of government. Kambar successfully performed the service for which he had been engaged; but having in a few years quelled the robbers against whom he had been called in, and finding himself at the head of the only military tribe in the country, he formally deposed the raja and assumed the government. The history of the country after the accession of Kambar is as obscure as during the Hindu dynasty. It would appear, however, that the sceptre was quietly transmitted to Abdulla Khan, the fourth in descent from Kambar, who, being an intrepid and ambitious soldier, turned his thoughts towards conquest. After various success, the Kambaranis at length possessed themselves of the sovereignty of a considerable portion of the fruitful plain, including the chief town, Gandava. Abdulla Khan was killed in a battle with the forces of the nawabs of Sind. He was succeeded by his eldest son, Haji Mahommed Khan, who abandoned himself to the most tyrannical and licentious way of life and alienated his subjects by oppressive taxation. In these circumstances Nasir Khan, the second son of Abdulla Khan, returned to Kalat and was hailed by the whole population as their deliverer in the year 1739. Nasir Khan proved an active, politic and warlike prince. He took great pains to re-establish the internal government of all the provinces in his dominions, and improved and fortified the city of Kalat. In 1758 he declared himself entirely independent of the king of Kabul; upon which Ahmad Shah despatched a force against him under one of his ministers. The khan, however, raised an army and totally routed the Afghan army. On receiving intelligence of this discomfiture, the king himself marched with strong reinforcements, and a pitched battle was fought in which Nasir Khan was worsted. He retired in good order to Kalat, whither he was followed by the victor, who invested the place with his whole army. The khan made a vigorous defence; and, after the royal troops had been foiled in their attempts to take the city by storm or surprise, a negotiation was proposed by the king which terminated in a treaty of peace. The khan frequently distinguished himself in the subsequent wars of Kabul; and, as a reward for his services, the king bestowed upon him several districts in perpetual and entire sovereignty. This able prince at length died in extreme old age in the month of June 1797. He was succeeded by his eldest son, Mahmud Khan. During the reign of this prince, who has been described as a very humane and indolent man, the country was distracted by sanguinary broils; the governors of several provinces and districts withdrew their allegiance; and the dominions of the khans of Kalat gradually so diminished that they now comprehend only a small portion of the provinces formerly subject to Nasir Khan. The rulers of Kalat were never fully independent. There was always, as there is still, a paramount power to whom they were subject. In the earliest times they were merely petty chiefs; later they bowed to the orders of the Mughal emperors of Delhi and to the rulers of Kandahar, and supplied men-atarms on demand. Most peremptory orders from the Afghan rulers to their vassals of Kalat are still extant, and the predominance of the Sadozais and Barakzais was acknowledged so late as 1838. It was not until the time of Naslr Khan I that the titles of Beglar Begi (Chief of Chiefs) and Wali-i-Kalat (Governor of Kalat) were conferred on the Kalat ruler by the Afghan kings. Gibbon's description of the history of Oriental dynasties, as 'one unceasing round of valour, greatness, discord, degeneracy, and decay,' applies well to the Ahmadzais. For the first 150 years, up to the death of Mlr Mahmud Khan I, a gradual extension of power took place and the building up of a constitution which, looking at the condition of the country, is a marvel of political sagacity and practical statesmanship. A period of social ferment, anarchy, and rebellion succeeded, in which sanguinary revolts rapidly alternated with the restoration of a power ruthless in retaliation, until at length the British Government was forced to interfere.